I was able to catch a pretty shot of Northern Harbour on this morning’s departure from Kenora. Click on the pictures to see a larger version that can be zoomed to 100%. Northern Harbour is at the very left edge of this shot, while Bald Indian Bay is on the right. All that ice in the middle distance is Bigstone Bay, and in the far distance at the right is ice on the big water south of the Eastern Peninsula. On our return this evening, we swung over for a better look at that. This is well south of Kenora, closer to Sioux Narrows. Shore Island is just below the center of this picture that looks west. 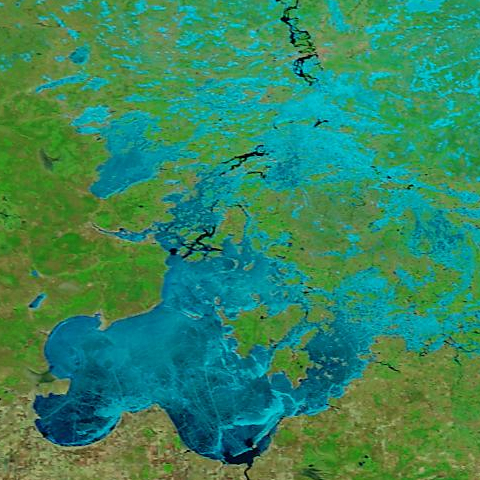 Beyond it is the largest pan of ice remaining on Lake of the Woods. 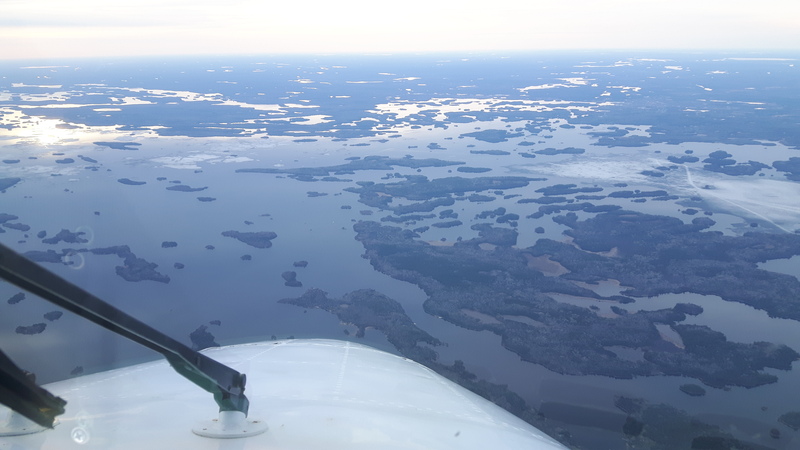 Chisholm Island and Cliff Island are at the left edge, and way off in the distance is Shoal Lake. We couldn’t see any ice around Sioux Narrows, by the way: Long Bay and Regina Bay were entirely clear. Next shot, closer to Kenora. Hay Island is at the right, with Scotty Island above the center. That’s Whisky Island pointing like an arrowhead to where the sun is glinting on the waters of the Manitou. There are still a few loose pans of ice out that way, but the patch on Bigstone Bay at the right is much more substantial. Zoom in on this picture, and you should be able to make out some boats. Hint: look for the wakes. Back to check on Northern Harbour and the ice on Bigstone Bay. 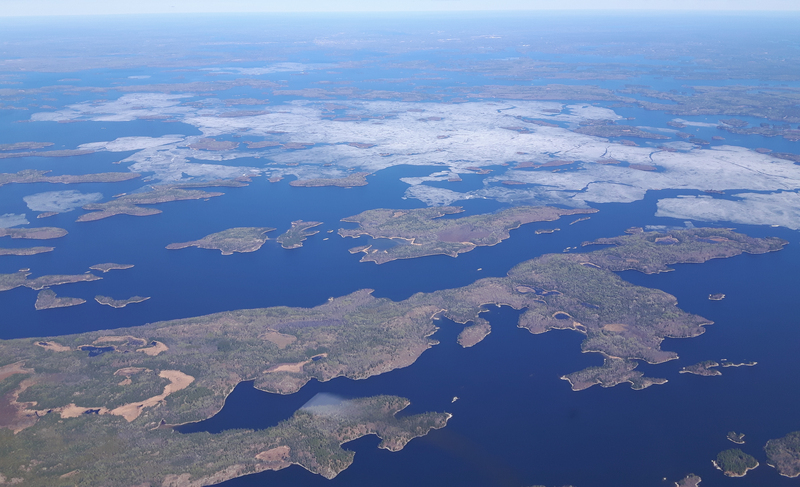 Middle Island and Hay Island are out of sight under the plane in this shot that looks north east over the Hades Islands at Bald Indian Bay, Sultana Island and Pine Portage Bay. Think of this picture as the opposite of the morning shot. 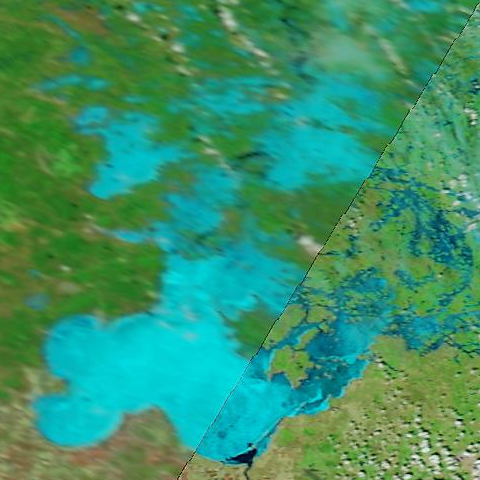 This is the second largest pan of ice left on Lake of the Woods. 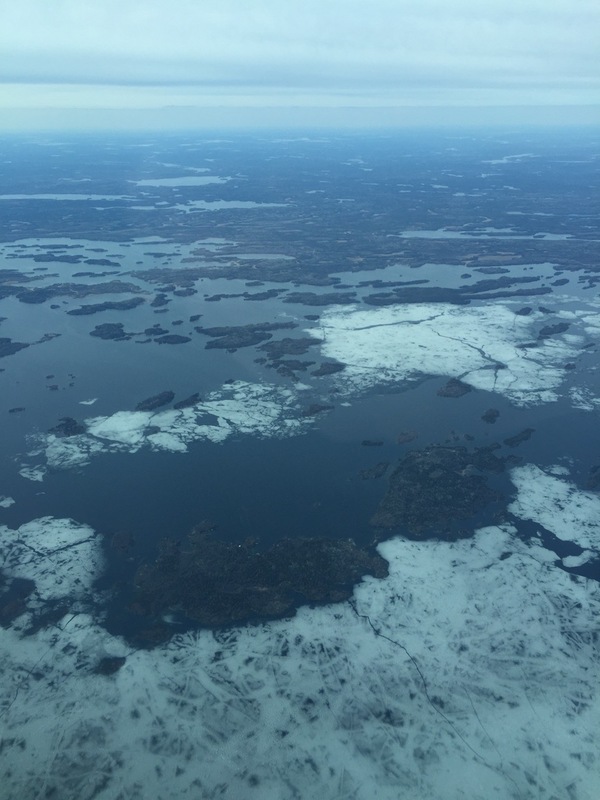 Lastly, Matthew Render sent me this shot of Shoal Lake. He’s been a contributor since Ice Patrol went online in 2014, and he’s a real help because he regularly flies right over Shoal Lake, which I can seldom do. This week he’s not in the neighbourhood, but he got a friend to take a picture and forwarded it to me. 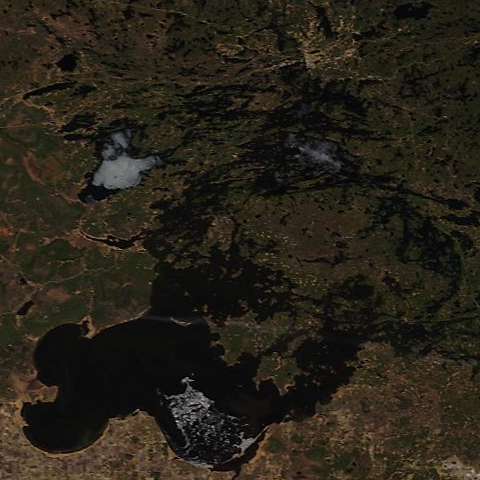 This picture looks north, and it’s clear that most of the ice is in the southern portion of Shoal Lake. Above the large pan of ice at the middle right is Cliff Island, and north of that, it looks like the lake is clear. Above Indian Bay, at the left, you can see Falcon Lake and West Hawk . I believe they are clear now. I think Clearwater Bay is wide open. It certainly looked like it, but I was too far away to be absolutely sure. Regional temperatures rose to 19ºC this afternoon, and it was breezy, too, so a lot of ice melted. East of Kenora, Eagle Lake at Vermillion Bay was almost clear this evening, and Wabigoon Lake at Dryden is about the same or better. Sioux Lookout is going fast; there was a floatplane on the water there this evening, and further north, Red Lake’s ice is very weak. Near Kenora, all the small lakes are clear, with the sole exception of Silver Lake, a deep lake that always thaws late. For most people, Lake of the Woods is open. My eyes at the Clarion Lakeside Inn tell me the floating bridge to Coney Island came out today, to open up the waterways to boat traffic. The remaining ice will be gone this week, probably by Wednesday. That would be a day later than last year. It would also be Star Wars Day: May the Fourth be with you. May 3, 2015: That’s It! Tom Hutton is not only one of my professional pilot colleagues at Walsten Air, he’s also a member of the Kenora Flying Club. Today he took me out for an hour in the club’s Cessna 172, and we could not find any significant ice. If you hurry to Heenan Point, you might be able to pick up enough to fill a picnic cooler, but it was going fast, and by this evening there won’t be enough left to make a decent martini. If you click on this picture to see it full size, you can make out a tiny patch of ice clinging to the tip of Heenan Point. By the time you read this, it will probably be gone. We flew as far south as Sioux Narrows. We flew as far west as Allie Island and had a look at the area south of the Barrier Islands where Andrew found ice yesterday. Those patches in front of the wing strut are just ripples on the otherwise glassy water. No ice. We checked around Scotty and Middle Islands, where a few pans were floating yesterday. Bald Island and Queer Island in the middle distance. Scotty Island, Middle Island the Hades and Hay Island further back. I’m calling it. 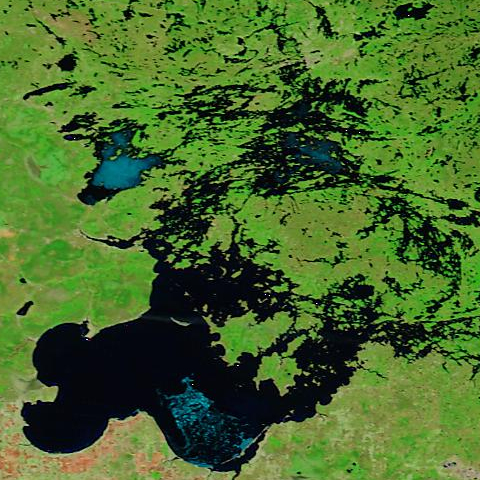 Lake of the Woods is ice-free as of May 3rd, 2015. 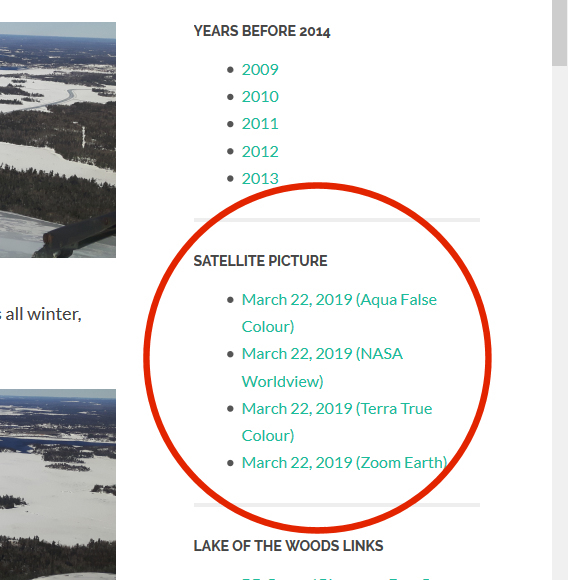 It looked as if there was still ice on Shoal Lake, but by the time the daily satellite picture was taken, none was visible. If Matthew or anyone sends me another photo before it is gone, I will insert it here. Lake of the Woods Ice Patrol will now go dormant until next spring. Thanks to everyone who helped by visiting, commenting or sharing with friends. We ran the hit counter up from 70,000 to 130,000 this spring, and peaked at over 2700 hits on a single day (April 28th). Anxiety last year about ice persisting into fishing season and even the May long weekend drove hits to 3700 one day, but I knew we’d never match that during a normal spring like this one. Special thanks to all the pilots who donated their time and flying expenses to help me provide better coverage. In approximate order of first appearance: Andrew Kozlowski, Matthew Render, Al Nelson, Rob Reboks, Dave Thiele (and his daughter Alice and son Eric on camera duty) and Lindsay Kitson. Much of what you see here was made possible by the other folks at Walsten Air: the bosses who allowed me leeway in my flight path, the dispatcher who assigned me flights returning to Kenora without passengers, the maintenance department that alerted me to non-revenue flights, and our pilots. I think every single one of our pilots chipped in this year by flying while I took pictures or taking pictures for me on days when I could not. We have a great crew. As a former float-plane pilot, I’d like to sign off with a safety reminder. Kenora has a busy water aerodrome on Safety Bay. During take-off and landing, aircraft have the right of way over boats. Please watch out for them and try to keep clear during these critical phases of flight. After the plane has landed and dropped “off the step” to taxi slowly, the plane has the same rights as any other boat. However, they have no brakes and do not steer all that well. It would be nice (and safest) if you would treat them like sailboats and keep a wide berth. Thanks. I’ve been neglecting my other hobby for two months while I did this blog. 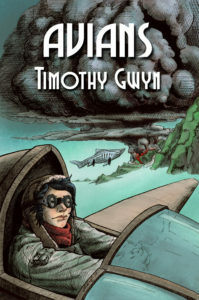 If you want to see how my efforts as a science fiction author are panning out, you are welcome to visit Timothy Gwyn* Writes, (*my pen name) a blog where I comment on books I have read, conventions I am going to, and the occasional publishing success. Otherwise, I’ll be back here around the middle of March 2016. Have a great summer on Lake of the Woods!